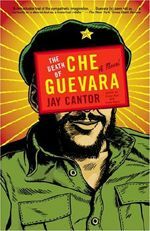 Towards the end of Jay Cantor’s novel The Death of Che Guevera, Guevera’s friend and would-be biographer Ponco muses, “It doesn’t matter how many times I write ‘The End’; it’s not over.” That reference to Ponco’s incessant inability to finish the story of Che and his death encapsulates Cantor’s book. It staggers along from its opening page to the conclusion almost six hundred pages later, never finding a consistent rhythm or place to tell the story. Whatever the reason, the novel is truly maddening, as it switches narrators and flails through any number of styles. Sections written in stream-of-consciousness rub up against passages of imagined screenplay complete with stage directions. And the novel never seems to end, especially as Cantor spends the last few hundred pages detailing Che and his band of guerillas unavoidable defeat in the jungles of Bolivia. After about the tenth description of Che’s conflicting feelings of frustration with rallying the peasants to his cause and anger at their disinterest in his cause, we more than get the point. The book is divided roughly into two halves, with the first half detailing Che’s upbringing in Argentina and his travels as a young doctor before moving on to his career as a revolutionary in Cuba and Bolivia. The book’s ultimate aim is to re-imagine Che’s leading of the failed revolution in Bolivia, and it often switches from his perspective in midstream to any one of his loyal guerillas. Both sections of the novel are filled with fine writing. Cantor has a keen ear for dialogue, and he colors his scenes with a solid eye for detail. The descriptions of Third World poverty and the insurmountable odds Che faces in his struggle are spot on, and regardless of your opinion of Che, you feel sympathy for his character and root for him. In fact, the most impressive aspect of the book is Cantor’s total immersion in this fictional version of Che Guevera, who is brought to life in all his conflicted, asthmatic glory. Every time Che wheezes from his wrenching asthma, we feel it. We never doubt this fictional Che as a character, and the ongoing slog of war in Bolivia is eerily reminiscent of a certain bog of a war in the Middle East. That being said, The Death of Che Guevera as a whole is a mess. The book was Cantor’s first, and he is to be excused for many of the book’s shortcomings. For one, it’s a nearly impossible task to bring such a polarizing figure as Guevera to life in a novel. So much has been written about him that neither supporters nor detractors of Che will be completely satisfied with his portrayal in the book. Yet Cantor is able to take the focus off of whether Guevera was right or wrong in his actions. He’s presented as a character-a flawed and well-intentioned character. For that point, Cantor is to be congratulated for his ambitions, especially in a first book. Unfortunately, that puts the focus on the writing, and it’s too inconsistent to make the book succeed. The book could have been stopped halfway through. The first section is excellent, and we are shown the dynamics of Guevera’s family, complete with the normal family dysfunctions. The shadow of Fidel Castro looms large over this character, but unfortunately, Castro never emerges as a main character. Instead, Che and his comrades talk and talk and talk about Fidel, and we’re left wanting to have more of Fidel on the page in all his maniacal certainty. Moreover, Cantor can’t focus on one style. Most of the book is written in the form of journal entries, which prevent the book from forming a consistent narrative presence. Though the first half is told almost entirely in first person from Che’s perspective, we are given many different first person accounts in the second part. With such a dominant character as Che present, it’s fruitless to try and give minor characters a voice as big as his. The reader just isn’t interested. Jay Cantor’s novel isn’t without its strengths, but its all-over-the-place writing and style drains it of its emotional resonance. It is also hard to understand why there was a need to reissue the book, but for lovers and haters of Che, it often makes for a provocative imagining of what his motivations might have been. In any case, it’s always interesting to see such an idolized character stripped down to his base human needs and desires. It’s too bad we don’t see enough of that in the novel.